Anthem MRX 310 was named 'best sounding' receiver in "The Best Receiver" roundup! 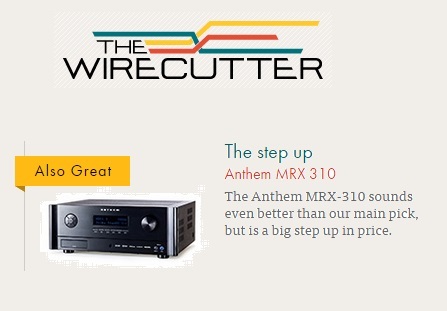 "If you’re looking to step up to something that sounds even better (for a lot more money), the $1,200 Anthem MRX 310 is a great choice. It produces accurate results for crossover and frequency response (a rarity), and allows you to optimize your system for both movies and music with different settings. It can also take the room into account to determine the appropriate volume level..."
Click here! to read the full article from The Wirecutter. Click here! to learn more about Anthem MRX receivers.